My second pick for innovative use of veal stock came in from Marc Barringer, Chef/Hopsitality Director, St. Michael’s Episcopal Church, Grosse Pointe Woods and Food Service Director, Lost Lake Scout Reservation, Freeman Twp., Michigan. He’s also a freelance writer, innovative cook and classic jack-of-all-trades in the best cooks tradition (still a school crossing guard! God bless him!). Veal stock is one of the great preparations of the kitchen that can elevate everyone’s cooking, and someone on twitter asked me what you could do with it. It lead to a lot of great ideas, in addition to the traditional uses for making sauces and enriching braises. I’ve worked in and out of the food industry since I was a teenager in the 80’s. Worked at every back of the house position in many different restaurants. I’ve also worked as a portrait photographer, technical writer, outdoor recreation equpiment tester/salesman, and am still a school crossing guard. My adventures in bread began in college. A recipe for Tuscan Bread in Esquire started me baking in a common dorm kitchen in 1987. The sunday night loaf became an event enough that it helped grow a common meal group that lasted years. It also led me in the direction of all yeast breads and cinnamon rolls. 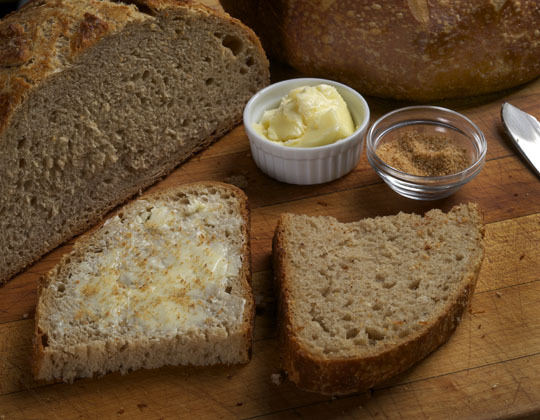 I also participate on the Fresh Loaf website and tease the folks at Zingerman’s Bakehouse. The genesis of this bread was at Toast, a restaurant in Birmingham, Michigan; where I was hired as part of start-up crew. We were taking an established breakfast and lunch restaurant from Ferndale, a bohemian part of town and opening the second location in a seriously upscale area; plus we were asked to create a dinner and full dessert menu. I had room to play a bit and make up breads and desserts that went along with the chef’s and owner’s vision for the menu. I was in the kitchen making cinnamon rolls for French toast and the bartender came in complaining about the Guinness tap being a bit foamy. I went out to the bar with a measuring cup and pulled a bit more than a cup of Guinness, just to see how bad it was. I retreated back into the kitchen and let the Guinness sit out while I was scaling the rest of the ingredients for the baguettes. When it came time to start making the bread, I was struck with an idea; I added the beer. I just added what I knew would be good. Within this moment I knew I needed more liquid. More beer? Just then the sous chef asked for the veal stock from the fridge next to me. We used a lot of veal stock in our dishes because it is a great way to add depth to them. Why not use it in bread? I warmed up what I needed and made the bread with veal stock. That was the start of the veal stock and Guinness bread. The bread is just a variation on the Ratio 5/3 ratio of bread flour and liquid. I also use sourdough starter in almost all the bread I bake, even if I am adding instant yeast. Due to some fat in the stock, it is not a completely lean dough. You may need to cut back on further fat enrichments if you were planning them. The beer and stock (and its gelatin) make the dough slightly stickier. I haven’t tried it yet, but I’m thinking a 100% stock bread may have rise issues. Autolyse, mixing the dough just to combine all the ingredients, then letting it rest for 10 or 20 minutes before completing the mixing, is necessary. And by all means, let the dough rise as long as prudent. The super-long rises of the “no knead” breads takes this bread in deep flavor directions. The enzymes loose in the mix have so much more to work with. If you were using the Dutch-oven baking method, the crust would be even better. Combine the bread flour, veal stock, Guinness, and starter in a the bowl of a standing mixer (or any bowl if you’re mixing by hand). Mix just to combine. Cover the bowl with plastic wrap or a damp towel and allow to rest for 10 to 30 minutes. Add the yeast and salt. Mix and knead the dough until the dough is smooth and elastic, about 10 minutes. You should be able to stretch the dough to translucency without tearing it. Let the dough rise in the bowl, covered, till it has doubled in size, at least two hours and as many as four. Preheat your oven to 450 degrees F/232 degrees C. This will take about 30 minutes for the oven to reach temperature. Knead the dough to force out gas and redistribute the yeast and shape it into a rectangle about an inch thick. Let it rest for ten minutes covered with a towel. Try making veal stock bagels with Bruce Ezzell’s bagel recipe. Bread Baking Basics App for the iPad is a wonderful addition to your digital library. The iPhone App will be out soon. Two Sisters Bakes is a great blog about a bakery up in Alaska run by Sharon & Carri. Don’t fear the microbes, a post explaining baking with yeast. Jeanne Carpenter explains more about cheese in her blog Cheese Underground. Learn more about the iPad Bread Baking Basics. When I was going to Lost Lake as a scout in the 80’s, I certainly don’t remember eating anything like this. I feel like I missed out! Toast is one of our go to weekend breaksfast places. I will have to stop by there for dinner sometime and see if this is still on their menu. Probably not. They are still a great place, but I’m not sure if this fits the set-up they have now. Not bad, just not the same. I am not trying to be a pain, because the idea is cool (made bread with beer before, but not stock) but as the directions are listed you will have the oven at 450° for about 5 hours before baking. Just asking. Scott you are correct on the pre heat oven time. The time wiill be adjusted for preheat. Give your oven ample time to come to 450f. More so if you keep a stone in the oven. I give myself about 20 past the “beep” to get things evened out. Oh wow. Just. . .WOW! I am SO going to try this – I just happen to have some homebrewed stout and some veal stock on hand. I love the idea of using stock as part of the liquid in a bread dough. I’ve not seen a recipe or even thought to do such a thing. Thank you for this. Oh wow is right; sounds amazing. Now…what if a girl just has beef stock…will that do? Damn, I wish I saw this recipe was in the Winter. Seems like a dark flavor for Summer but I’m trying it anyway.